Warm-Up System: Again | Go to Sleep. Study. Mathinate. 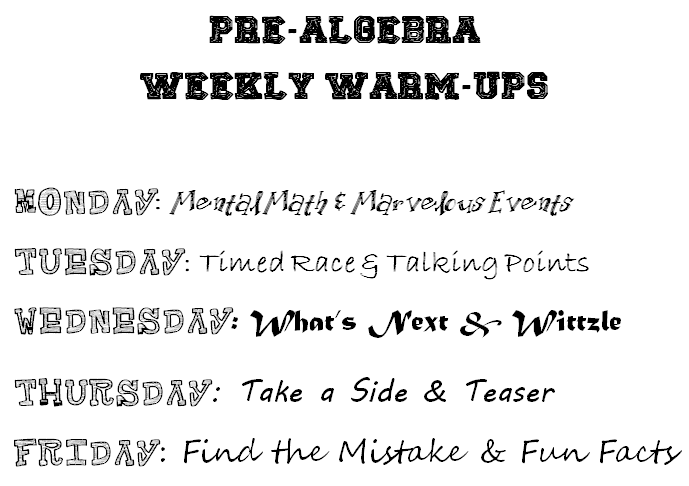 I loved having warm-up schedules last year, but for pre-algebra in particular, the formatting was not as cohesive as it could’ve been. By only having a template for Thursday and Friday, I had to print out the pages I wanted from What’s Next and from Week by Week Essentials, and then I had to order all of the pages before running through the copier. Occasionally, I made a mistake. Also, my students really struggled with finding and completing the patterns and with answering all 10 questions. Sometimes, they just gave up and we’d end up using a lot of class time doing the warm-up together. On Monday, the students will do 6 mental math problems, which will be projected on the board. I think I’ll pull 6 of the 10 featured in the Week by Week Essentials. I’m using “Marvelous Events” instead of “Good Things” just because I wanted the first letter of the subtitles to match the first letter of the day of the week. Tuesday is going to incorporate a timer and 20 basic facts. I wasn’t sure what to do as the second part (I wanted to keep fun facts on Friday, so I didn’t want to do trivia again), but then I saw Elissa Miller’s newest post with talking points and loved it. I think it’ll be really interesting to get the students’ perspectives on those statements. On Wednesday, I’ll be incorporating patterns by using Fawn’s Visual Patterns, but I won’t have the pre-algebra students do as much as I expect from the Algebra I students. I want them to be able to draw the next step and then describe how the pattern is being generated. The second part is Wittzle, which I hadn’t heard of until I saw Sarah’s post, but it seems very similar to Krypto, which I teach my students during the first week of school. I think this will be a good challenge every week, similar to how I include KenKen for Algebra I.
Thursday still features “Would you rather…?” questions, but again I rephrased it. The teaser will come from the Wackie Wordies section on CommonCoreSheets.com. Finally, Friday has a new feature. I’m going to show a mistake on the board for students to analyze. They have to figure out what the mistake is and how they would recommend correcting it. The fun fact is a fill-in-the-blank trivia statement, just like I did last year. The whole week relies on a template, like my Algebra I did last year, which will make preparing copies so much easier! I hope that the new schedule will work even better than last year’s. I really think the variety and the community-building will pay off. I’m so grateful to everyone that has shared their warm-up strategies and ideas!